I find that the only time of the year that I knit and crochet are during the winter holidays. It's perfect for gift giving, but more importantly, it's perfect for keeping my fingers warm on cool nights. I find that doing any crafting, creating, and making is great for boosting moods and calming souls. The feeling of accomplishment and the process of creating itself is such a soothing activity. Also, it really sets a wonderful tone for the holiday season. 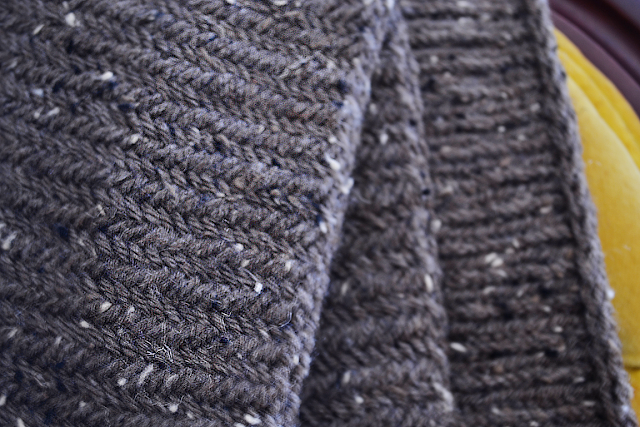 This year I learned how to do the trendy herringbone knit stitch via SteamyKitchen.com. Unfortunately, by the time I finished the scarf earlier this year, it was too warm to wear it. Instead, I tucked it into my scarf box in my closet and am waiting for a cooler day this winter to wear it! Scarfs for me can really tie a look together. The look is of cozy and comfortable, as well as put together and well thought out. An instant pick me up on chilly days! Also, remember how I posted here that I have all the ingredients now for a blog? I have one more perfect ingredient! 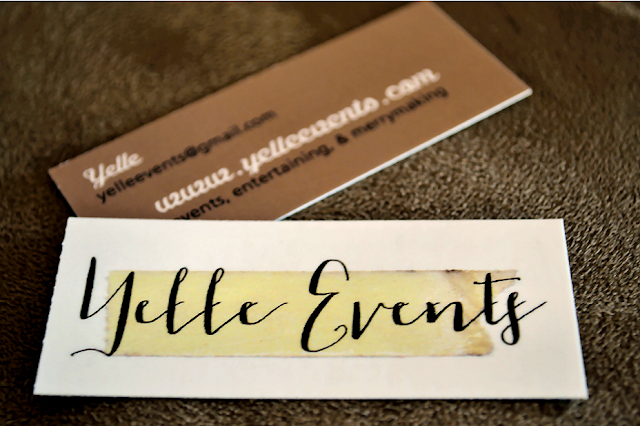 Thanks to the lovely Erin from one of my favorite blogs, Like Want Need, I now have Yelle Events business cards! 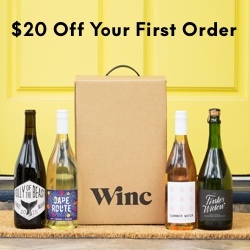 Moo.com had a promotion for 100 free business cards, you only pay shipping! 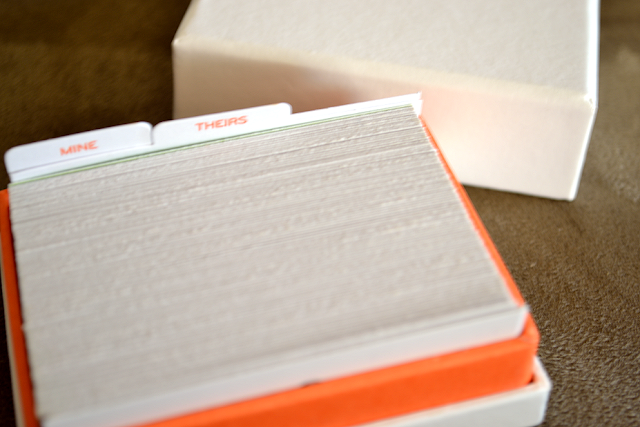 I jumped at the chance to get these elongated blog cards printed, just in time for my web domain purchase! Erin's blog is also now on my Link Love! Be sure to click over and check out her lovely blog, especially if you're like me and her and love all things French. Your cards are beautiful! And that scarf? I love it! I need to pick up knitting I do believe. I LOVE the business cards! I am very fond of your header, and it translates so nicely to this format. 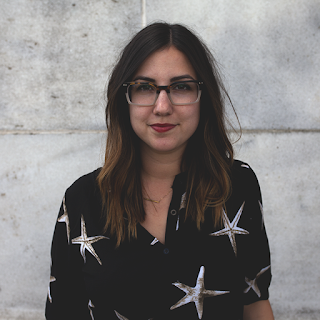 Gosh, I guess I'd better get on that whole blog makeover and business cards thing. Thanks for the motivation, Yelle :). I've also got knitting projects from last year I never finished... you're right, there's something about the colder weather. I'm never going to be a Meredith, knitting and crocheting the year through! This post makes me want to pick up my knitting again too! Love the business cards too! First off, that scarf is amazing! I'm a huge scarf fan, you're right, they totally tie an outfit together. I'm guilty of wearing light scarves in the summer when it's beyond the appropriate temperature, but I just can't help myself. I wish I could knit/crochet like you. I'll have to take my grandmother up on her offer to teach me. Herringbone is so chic! Thanks for stopping by! Although I know it's not what you were featuring,I love that chair...it's absolutely gorgeous! Im working on a scarf for my boyfriend right now. Hoping I finish it soon since the days are starting to finally get cold! 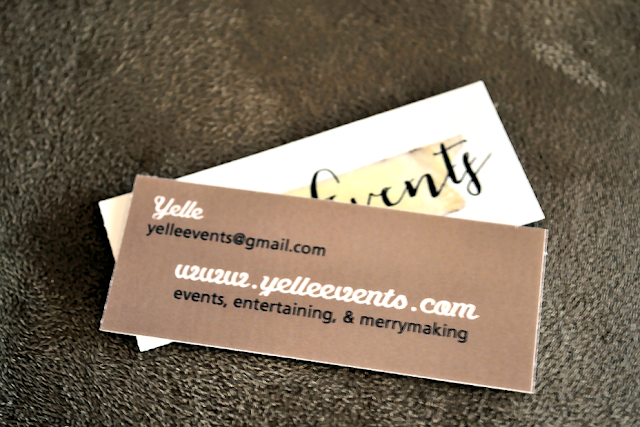 Also business cards are a fantastic idea! & for that deal sold! 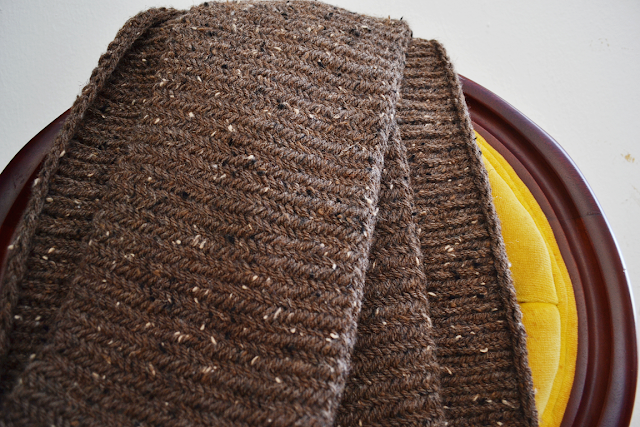 Oh, that herringbone knit looks so yummy. You're tempting me back into knitting! 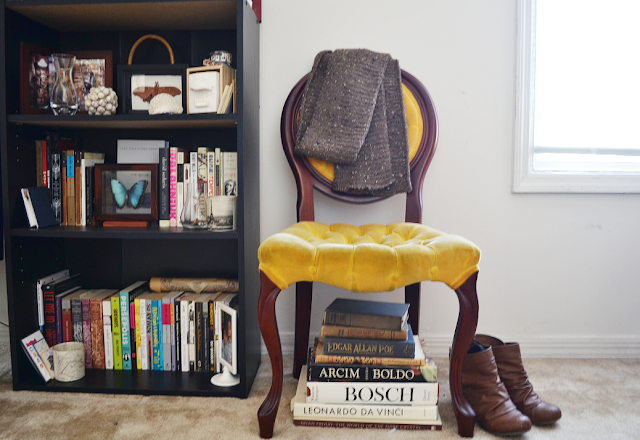 That yellow chair is gorgeous. I love a good scarf but I just can't seem to make them work for me. I always feel super conscious when I wear one. i love anything herringbone! i'll have to put that scarf on my to do list! I love scarves, mitts and anything handmade!